Seven members of the No. 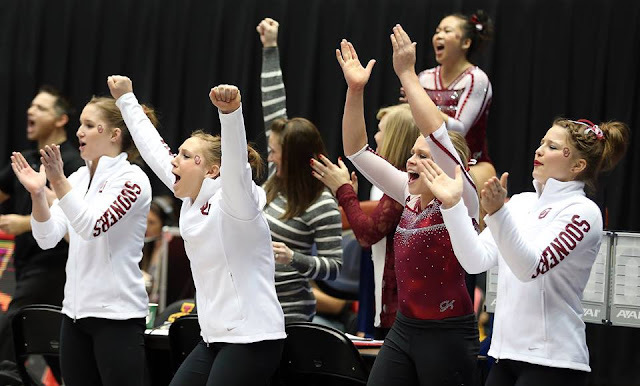 1 Oklahoma women's gymnastics team secured a conference-high 12 spots on the All-Big 12 Gymnastics Team, the league office announced on Wednesday. This season marks the ninth straight year that the Sooners have led the conference in All-Big 12 selections and it is the seventh consecutive season that the Sooners have earned at least nine all-conference selections. The All-Big 12 squad consists of the top three conference gymnasts with the highest regional qualifying score (RQS) in each event in addition to the top two all-around gymnasts. Junior Chayse Capps picked up a total of three awards, tied for the most in the conference. Capps was recognized on beam for the third straight year, and she grabbed awards on bars and in the all-around in her first season competing in each. In her three seasons at OU, Capps has secured seven total All-Big 12 honors. Earning two honors were senior Haley Scaman, sophomore AJ Jackson and freshman Nicole Lehrmann. Scaman was honored on both vault and floor, giving her 10 total All-Big 12 awards in her OU career. For the second straight season, Jackson also grabbed honors on vault and floor, and Lehrmann snagged bars and beam accolades. Three additional Sooners earned conference recognition in senior Keeley Kmieciak, junior McKenzie Wofford and sophomore Natalie Brown. Kmieciak's bars honor was the second of her career and fourth overall All-Big 12 award. Wofford earned a spot on the bars listing for the second straight year, and Brown captured her first All-Big 12 honor, earning a spot on beam. The Sooners (20-1 overall, 3-0 Big 12) open postseason competition this weekend in Frisco, Texas, as they head to the 2016 Big 12 Championships inside Dr Pepper Arena. The meet will pit top-ranked OU against new conference member and No. 10 Denver, Iowa State and West Virginia. Competition is slated to begin at 4 p.m. CT on Saturday. Tickets to the championship can be purchased online.